I'm really not sure how this has happened but today I find that my slow Sunday stitching is sewing on binding. And here's a reminder that the July's AHIQ link party goes live on Tuesday. Great news! A finish is in sight! Enjoy the last stitches on this quilt! Most people seem to dislike the binding, but I love it. It means I'm close to the finish and someone is going to receive a quilt. 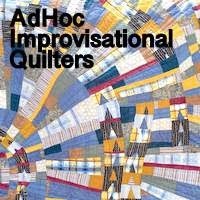 It's bittersweet, sure, but I manage to look at the positives of finishing a quilt. Wooohooo! Binding is one of the parts of the process I love. Just seeing the edge of the quilt is quite intriguing. I so enjoyed seeing the pictures of your lighthouse quilt project. I also noticed the use of "Hearty Good Wishes" or "More Hearty Good Wishes" fabrics. I loved those fabric lines and you've captured the feeling of sea and harmony in your lighthouse blocks. Lovely lovely. . .